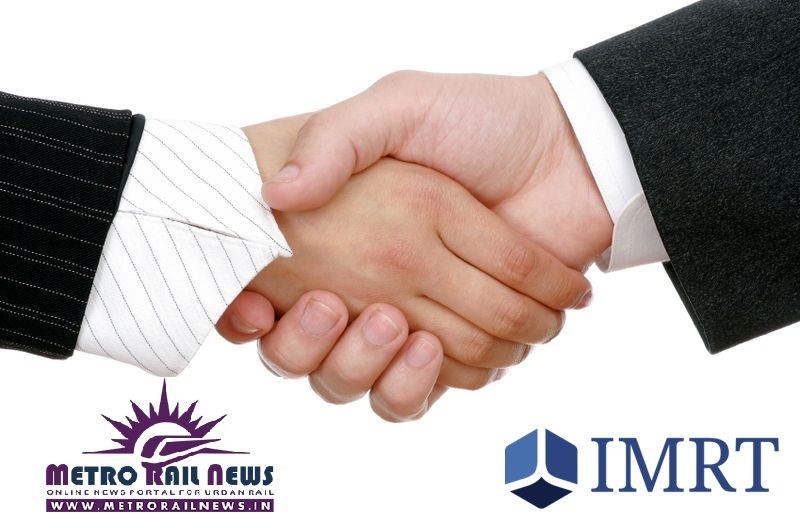 Metro Rail News signs MoU with IMRT for knowledge exchange and promotion of Metro & Rail Technology in India. New Delhi: The Institute of Metro & Rail Technology (IMRT) and Symbroj Media Pvt. Ltd. (SMPL – Sole publisher of Metro Rail News), the largest independent knowledge tank based in India, on Thursday signed a memorandum of understanding (MoU) to promote metro rail technology, research and academic exchanges. The agreement was signed by IMRT Founder Director & Member Governing Council Sunil Srivastava and SMPL Director Ms. Mamta Shah. Under the MoU, IMRT and SMPL agreed to collaborate on projects such as exchanges of academic resources, knowledge and faculty for research and development purposes. They also agreed to come up with jointly for promotion of their services and academic projects with the help of of digital, print, multimedia and social media tools. Metro Rail News Managing Editor, Ms. Mamta Shah said that “this was the first time Symbroj Media has signed an MoU with a specialized academic Institute, and said she looked forward to strengthening the academic and knowledge sharing ties between the two independent organisations. Metro Rail News is an exclusive and leading news service portal which provides complete and up to date information like project updates, tender, industry events, job notices, passenger information, media interviews etc. from various mass rapid transit systems like metro railways, mono rail, high speed bullet trains, sub-ways, trams, metro coach factories and associated industries worldwide. Metro Rail News offers business, advertisement and media partnership opportunities to the individuals, business organizations, event planners, metro railways, OEMs and coach factories worldwide. Metro Rail News has a well maintained and comprehensive Business Directory (Metro Rail Directory) as well as well qualified and highly experienced professional in Editorial Board. Metro Rail News is being owned, managed and published by a renowned media firm Symbroj Media Pvt. Ltd., New Delhi. The Institute of Metro and Rail Technology (IMRT) is a first-of-its-kind institution that aims to be a knowledge leader in Metro and Rail technology. IMRT was envisioned with the objective of producing next-generation ‘techno-managers’, capable of making crucial decisions using their skills and understanding of the sector. IMRT will groom a new breed of professional engineers for the rail and metro industry by designing, developing, and delivering high-impact learning programs through education and research. The institution’s strength lies in offering specialized training and education for engineering graduates as well as experienced professionals in the rail and metro space. IMRT is promoted by Balaji Railroad systems Limited (BARSYL), a consulting firm specializing in providing niche technical and management support to the railways of several countries.